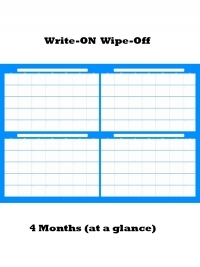 Large Write On-Wipe Off 4 Month Calendar With Marker This four months planner can be used for years to come. Keep all your appointments and your schedules visible-even from a distance! The Write-on Wipe-off liquid lamination makes planning, scheduling, and adjusting your appointments a breeze! Large Wall Calendar 39" x 27"
Block size: 2.7" x 2.2"